Join us at the upcoming Fraser Valley Home & Garden Expo February 10-12 at the Tradex in Abbotsford! We will be there to answer any questions you have regarding your upcoming kitchen, bathroom or custom refacing projects. Come meet the man behind the name, Kitchen Magician! Even our installer will be on hand on Friday only to answer any specific question you may have regarding your upcoming installation! We can’t thank you enough for our new kitchen! I love how it turned out (better than I could have ever imagined). 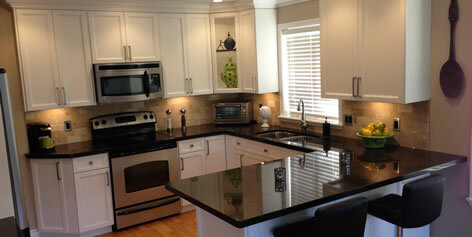 Who knew you could take a 23 year old kitchen and turn it into a modern fabulous looking kitchen. You guys are so professional and honest, and when you say you will be there at a certain time on a particular date, you are.